A new free pattern has been added. It’s a warm hat and an accompanying scarf. Originally made for Brian, a paramedic serving in Northern Ontario. Warm around the ears and windproof because it’s knit at a slightly tighter tension than usual. I made it in Patons Classic wool but it can be knit in other worsted weight yarns such as Knitpicks Wool of the Andes. The pattern has video links for a great provisional cast on method, Kitchener stitch (grafting together) garter stitch and diagrams for how to do an SSK – great things to add to your bag of tricks if you don’t know them already. 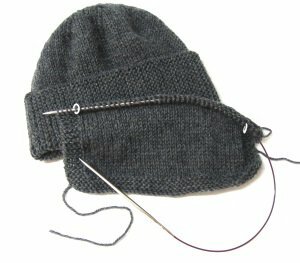 The hat also presents an easy introduction to working with circular and double-pointed needles. The Variations on a Theme section which presents some colour ideas and an alternate method for knitting the hat flat. To finish it off there is a matching hat. Links to helpful videos will work on your tablet or smart phone. does your stocking stitch ripple?